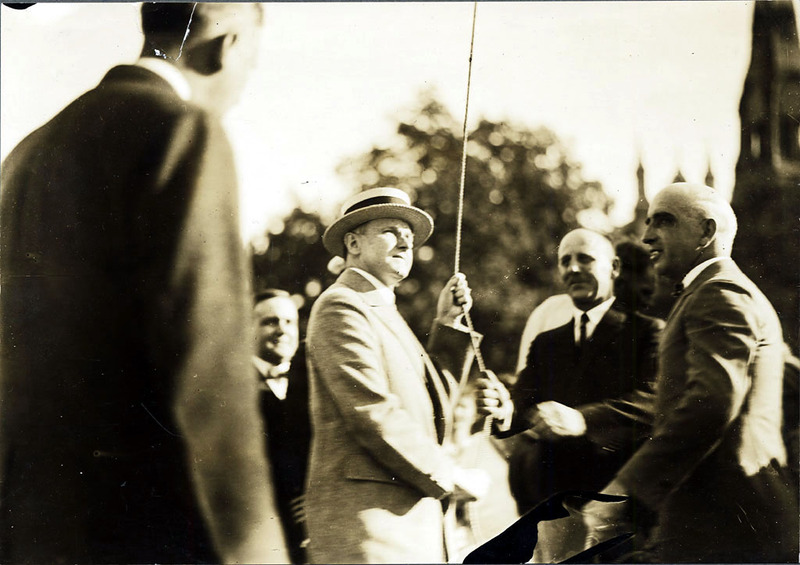 President Coolidge raises the flag over the Common at Lynn, Massachusetts, August 27, 1925. “Government is not, must not be, a cold, impersonal machine, but a human and more human agency: appealing to the reason, satisfying the heart, full of mercy, assisting the good, resisting the wrong, delivering the weak from any impositions of the powerful. This is not paternalism. It is not a servitude imposed from without, but the freedom of a right to self-direction from within. Industry must be humanized, not destroyed. It must be the instrument not of selfishness, but of service. Change not the law, but the attitude of the mind. Let our citizens look not to the false prophet but to the pilgrims. Let them fix their eyes on Plymouth Rock as well as Beacon Hill. The supreme choice must be not to things that are seen, but to things that are unseen. “Our government belongs to the people. Our property belongs to the people. It is distributed. They own it. The taxes are paid by the people. They bear the burden. The benefits of government must accrue to the people. Not to one class, but to all classes, to all the people. The functions, the power, the sovereignty of the government, must be kept where they have been placed by the Constitution and laws of the people. Not private will, but that public will, which speaks with a divine sanction, must prevail. “There are strident voices, urging resistance to law in the name of freedom. They are not seeking freedom for themselves, they have it. They are seeking to enslave others. Their works are evil. They know it. They must be resisted. The evil they represent must be overcome by the good others represent. Their ideas, which are wrong, for the most part imported, must be supplanted by ideas which are right. This can be done. The meaning of America is a power which cannot be overcome. Massachusetts must lead in teaching it. “Prosecution of the criminal and education of the ignorant are the remedies. It is fundamental that freedom is not to be secured by disobedience to law. Even the freedom of the slave depended on the supremacy of the Constitution. There is no mystery about this. They who sin are the servants of sin. They who break the laws are the slaves of their own kind. It is not for the advantage of others that the citizen is abjured to obey the laws, but for his own advantage. That what he claims a right to do to others, that must he admit others have a right to do to him. His obedience is his own protection. He is not submitting himself to the dictates of others, but responding to the requirements of his own nature. “When the inauguration was over I realized that the same thing for which I had worked in Massachusetts had been accomplished in the nation. The radicalism which had tinged our whole political and economic life from soon after 1900 to the World War period was passed. There were still echoes of it, and some of its votaries remained, but its power was gone. The country had little interest om mere destructive criticism. It wanted the progress that alone comes from constructive policies” — Coolidge referring to the March 4, 1921 inauguration, The Autobiography, p.157. Echoed repeatedly since the onset of what became the Great Depression, the administrations of Harding, Coolidge, and Hoover have endured decades of mischaracterization under the laissez-faire label, as John F. Fox, Jr. has noted in his essay, “Progressivism in an Age of Normalcy” featured in the Wiley Blackwell Companion to Harding, Coolidge, and Hoover published last October. Coolidge’s oft-misquoted, “the business of America is business” or his “minding his own business” as his finest achievement are usually cited to prove his laissez-faire credentials. Despite more recent research that has begun to challenge the premise that Hoover “did nothing” which contributed to the Depression, study of Coolidge still seems to languish between dubious apprehension and ample ignorance. None of these three Presidents fit so neatly into that box, despite the devout attempts by some, with a religious zeal to defend what came after the 1920s, to stuff each one away there and lock them within permanently. It is as if merely evoking the term laissez-faire explains every reason why the economy collapsed seven months after unrelenting policy-upheaval while, it is claimed, the entire disaster could have been mitigated, if not altogether avoided through expansive government activity – like, you guessed it, the heroic Franklin D. Roosevelt’s “New Deal.” With more intervention, America could have escaped the “Great” in depression by averting all that caused it: the oblivious policies and reactionary neglect of “hands-off” politicians too clueless to intervene even when it meant preventing disaster. So goes the conventional narrative anyway. This is ahistorical revisionism engaged in by those with an ax to grind, a political outcome to achieve, rather than a genuine study of the record. 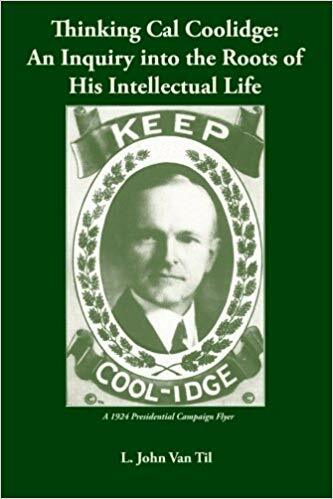 We have noted before, as have many others from the late Thomas Silver and Robert Sobel to Alvin S. Felzenberg and Michael Dukakis, that Coolidge was hardly laissez-faire. He was no modern liberal but neither is he the “non-interventionist” libertarian of popular imagery. Robert A. Woods, author of the excellent biography, The Preparation of Calvin Coolidge, addresses this very claim with a discussion issue by issue: Coolidge championed what then was known as a conventionally progressive platform both as state legislator and Governor. It is noteworthy that he took up an active agenda inherited from President Harding and built upon it. Cal’s First Annual Message, which we will be examining in greater detail soon, reveals a very ambitious agenda containing over thirty-three proposals for action on a broad range of issues. His frequent use of the appointment power remade policy at the Federal Reserve, the Shipping Board, the Courts, and everywhere its influence could be felt in accordance with Article II and the laws of the nation. These are not the actions of a “hands-off” bystander, letting events make decisions. He would go on to advance that agenda even after the death of his youngest son, so that he could say most of what had been proposed had become law by the time he left office, in 1929. This indicates a very different approach to the office than Coolidge is reputed to have. He parted with the Progressive Movement on one key particular, however: Coolidge kept the enduring relevance of the Declaration and Constitution, as David Pietrusza and Charles C. Johnson have both explored. Coolidge respected that both charters made progress possible. While the vast majority were jettisoning all ties with the founding documents, Coolidge kept moored to these “fixed stars,” as he called them, in our political firmament. They furnished solutions to their own limitations, via the amendment process and concept of law discovered, not made, by mankind. It was not for us to invent a new authority, to cast off what we perceived to be antiquated ideas, the soundness of the future rested on the progressive nature of the founding framework itself, starting with the importance of the Declaration and the continuation of duties, not merely an insistence on rights, as defined in the Constitution. 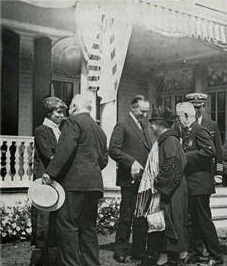 The Coolidges greeting visitors to the summer White House at White Court in the Adirondacks, New York, where executive business kept going throughout the summer,1926. It is not “Big Government conservatism,” whatever that may be, but the necessary precondition to service, the “true interpretation of the life of Christ.” Coolidge, presenting his own views, introduces us not to the “let be” approach wrongly assigned to his legacy, but to the example of service. As Coolidge continues explaining the third stage, Christ came to earth in “the form of a servant who is at the same time a master commanding His disciples to take up their cross and follow Him; it is sovereignty through service as opposed to slavery through service. He refuses to make the world wealthy, but He offers to help them make themselves wealthy with the true riches which shall be a hundredfold more, even in this life than that which was offered them by any former system.” It was this principle that Coolidge articulated all of his life, not the laissez-faire or statist ideals alternately attributed to him. Coolidge understood that it was what held together the unbroken line between the Framers and modernity, even after the challenges of industrialization. Technology did not change human nature. That was the fatal flaw in Progressivism, recommending government surgically take up the individual’s burdens without also stripping the individual of his or her liberties. Meanwhile, those liberties were not, as the laissez-faire advocates asserted, absolute or purist but channeled and defined by the eternal law of service, exemplified by Christ and sustained in the form of government adopted here in 1789. Had the Founders envisioned a laissez-faire or statist system, they certainly could have designed it so. They chose another way, however. The principles that brought together an energetic executive, a deliberative legislature, and an interpretive judiciary, to work side by side with state and local authorities, all ultimately accountable not to the law of letting each fend for themselves nor the law of centralizing control but to the law of giving and receiving the best possible service, serving one another. Anything less kept the weak weak or tore down the strong to render all weaker still. Former President Coolidge (second pair in line, left) walking in the parade commemorating Boston’s Three Hundredth Anniversary, 1930. This is how equal suffrage, minimum wage laws, the child labor amendment, and the outlawry of war treaty reconcile with what we know Coolidge believed when it came to limited government, budgetary discipline, tax reduction, farm relief, veteran’s bonuses, and intervention abroad. It was how Coolidge could brandish the veto power while also insisting on deference to constitutional authority in Congress to set immigration policy. It was how Coolidge could insist on the prerogatives of a strong Executive without betraying the powers rightly reserved to the states or the sovereign people. These were not the contortions of an uncertain or two-faced politician, they were principles kept grounded by the Founding, as even Jefferson learned as President. While so many of Coolidge’s generation had left those moorings to float adrift vainly in search of a “new order” that would move beyond the constraints of the past toward higher progress, the mind of the thirtieth president saw the issues with which the Framers dealt in human government as no different essentially from those of twentieth-century America, or our own twenty-first century, for that matter. We are no wiser for cutting ourselves off from that generation’s wealth of statesmanship. There could be no progress without the Founding. As such, Coolidge identified what the Progressive Movement had discarded to its doom. While the government America had adopted was neither unnecessary nor impotent toward the progress of the future, it was the natural fruit of and could only be built upon its declaratory principles. Those principles were common threads and shared guideposts between her form of governance and America’s continued growth and success. Though this may seem novel to some but obvious to others, it was how Calvin Coolidge viewed the world, not through the lens of socially atomistic laissez-faire theories but through the duty to serve, even when it comes to government administration, as Christ served: giving and receiving the best possible service. 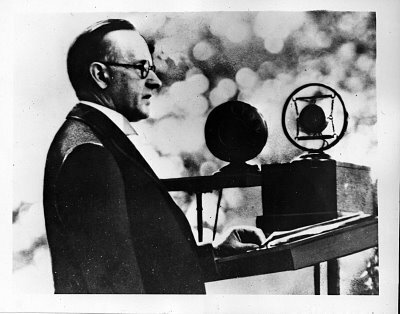 As L. John Van Til in Why Coolidge Matters, published in 2010, has said, “Indeed, the nation would be much better served if more of its Presidents had a world view as consistent as Coolidge’s.” Yes, it would.